If you are about to embark on the journey of studying abroad too much spontaneity and impulsiveness is likely to set you up for a fall. Preparation is the key word for those seriously considering studying abroad. A good way of preparing is learning about the study programmes and scholarship programmes abroad accessible for citizens of Georgia. Enquire about the educational institute or language school in the country of destination. Check out the website concerned, or call directly to find out more information about the institute or school. Before traveling you need to apply for a study visa in the embassy of the country of destination. For some countries this is a special visa for study purposes, in other countries this concerns a standard long-term visa. Do not trust mediators who ask money in advance without any written agreement. Globalisation is ongoing, the world is your backyard. Travelling across geographic (and cultural) borders is not only fun, but also very educational. 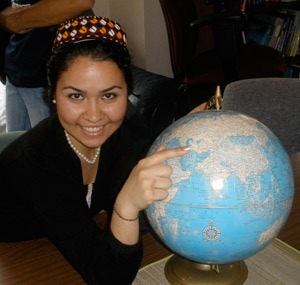 You will learn about other cultures, and also improve your international language skills. You will learn to cooperate among people with different cultural viewpoints and you will deepen your knowledge about the differences in the world, and how to cope with them. Employers and entrepreneurs value this international experience, making it will make it easier for you to get a good job. And, we believe learning about other places, cultures and people make you a richer and a better person. A new world of study options comes available! No matter which country your are from, there are always more programmes offered abroad than in your home country. You might be able to specialise more in that subject that you are so interested in, you can study at the university with the best research facilities, or choose an educational structure that you like the most. More possibilities - a better choice. A boost to your Personal Development. A period of studies abroad also means putting yourself in a totally new social environment. You will meet a whole lot of diverse people, and make new friends. Besides, you will have to setup and manage you entire life, away from the safe home environment. Encountering different people, different environments and different perspectives, do not only make you learn about these different perspectives, but also teach you a lot about yourself and your home environment. You will return stronger, more independent, more socially skilled and with a whole lot of new friends! The Acropolis in Athens, Greece; Scottish Highlands; The hart of Roman culture in Ancient Rome; The most Nordic city in the world; Paris, the city of love; High Tech Architecture in Rotterdam, Europe offers a great multicultural environment with unlimited possibilities to explore and learn. And while national borders in Europe are evading, it is very easy and cheap for students to travel. This is also a great possibility to get your high school French, German or Spanish from an awkward tourist level to a working professional level. The European citizens consider themselves citizens of the world and are generally very open to foreigners. In Higher Education, internationalization has been promoted for the last decades. This has resulted in a number of joint programmes offered by universities of different countries. Also, every university hosts a large number of international students. Other continents also have a lot to offer, if you are particularly interested in Asia, or any other continent, go there! Every continent has its own attractions, investigate them and make up your mind. The most important thing is that you come out of the experience as a more developed person. You will gain experience that you will help you both in you working life as your private life. Not all degrees are yet internationally recognized and compatible, not all programmes are totally in English. However, European universities have recognized this and are working hard to improve accessibility, uniformity and mobility. If you've decided to study abroad, that's the most important step. Considering the above, GOLDEN BRIDGE Center definitely offers education possibilities that you should consider. Gather information about countries, universities and study programmes, consider your options, make up your mind and go for it! Want to know MORE ABOUT STUDYING ABROAD? Finding a job abroad has much in common with finding a job in Georgia. However, there are language barriers and immigration requirements that complicate a job search abroad. It is very important to possess good skills of the language used in the destination country. Equally important is to have appropriate education and work experience. You must also be able to critically assess your own qualities and possess strong social skills that will help you to be successful in a foreign setting. Illegal workers are deprived of many basic social rights (adequate wages, insurance, health care, etc.). In many countries they are in constant fear of immediate deportation. Get a job offer and employment contract from an employer abroad. With the work permit and contract in hand you need to personally apply at the embassy of the destination country for a work visa. This is a different visa than a tourist visa. Only after you have obtained all these documents will you able to travel abroad. How can you be more successful in finding a job? Take initiative and have stamina. Rejections should not discourage you to keep on trying. Take part in additional training courses to increase your skills. Be very suspicious of job mediators that demand large sums of money. Qualified workers are also in demand in Georgia. Get more information on job opportunities in your own country! - Did I request from a firm/agent a document certifying the legitimacy of its activities? - Did the firm/agent propose to sign a contract outlining the responsibilities and obligations of both parties? - Did I read the contract carefully asking also the opinion of my family, friends, and a lawyer? - Does the firm have a partner firm abroad? Did I call or check the website of this firm? - Does the firm/agent promise to arrange my visa without me personally showing up at the embassy/consulate of the country of destination? Do not trust the firm/agent that promises to arrange your visa without your participation in the visa procedures. Most consular sections of destination countries demand that the applicant is present at the embassy while making the application. Do not trust firms/agents that tell you that you can go abroad on a tourist visa and find a job there! This will in principally all cases concern illegal work, because all foreigners need to obtain a work permit and, based on that, a work visa before traveling to the destination country concerned. Do not give your passport to anyone, except consular officers at the embassy and border control officials. Be in control of the situation. If there is an obvious need give a copy of your passport. How can I work abroad legally? The procedures vary from country to country. In principle the employer in the foreign country should file a petition on your behalf in the immigration service. After receiving a positive answer you will be mailed the form/contract with which you go to the embassy of the destination country to obtain a working visa. The consul is to make a final decision whether you meet all the conditions for issuing a working visa. Note: although Georgia has not yet signed any bilateral labour agreement with western countries, this does not mean that citizens of Georgia can not work abroad on a legal basis. Given the lack of bilateral labour agreements, a lot depends on the private initiative of people who want to find employment abroad. It is important to speak the language of the country you want to work in! It is important that you have either qualifications, or skills that are in demand in the destination country. Want to know MORE ABOUT WORKING ABROAD?